Mars is between the fish of Pisces when February starts. During the next few evenings, it will move from the western fish to the eastern fish. Uranus is waiting in the space between the easternmost fish and Aries for a close call with Mars on the 13th. The two planets will be 1° apart. A star named Torcular (also known as Torcularis Septentrionalis) is nearby. Uranus doesn’t move much. For the rest of the month, Mars moves alongside the head of Cetus the whale. 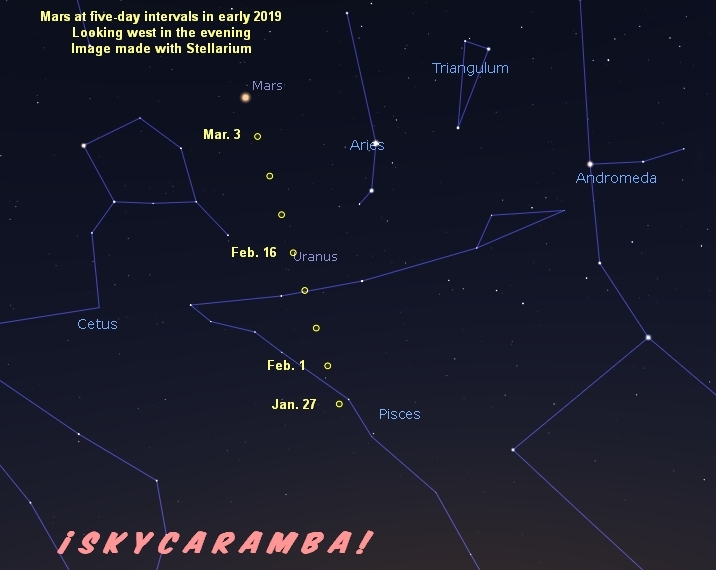 Keep an eye on Mars in the weeks ahead. It will pass between the Pleiades and Hyades in early April. Your best chance to catch Mercury this month is during the last week, even though it’s at perihelion on the 25th. The planet’s at greatest elongation 18.1° east of the sun on the 27th. Look for it in the head of the easternmost Pisces fish in the evening. With a clear enough horizon–that means few buildings, hills, and clouds–you should spot Mercury easily just one week into February. Northern hemisphere planet watchers will find Mercury a more difficult target as it’s heading into the sunset’s light in early March, but the moon passing by on the 7th will help. 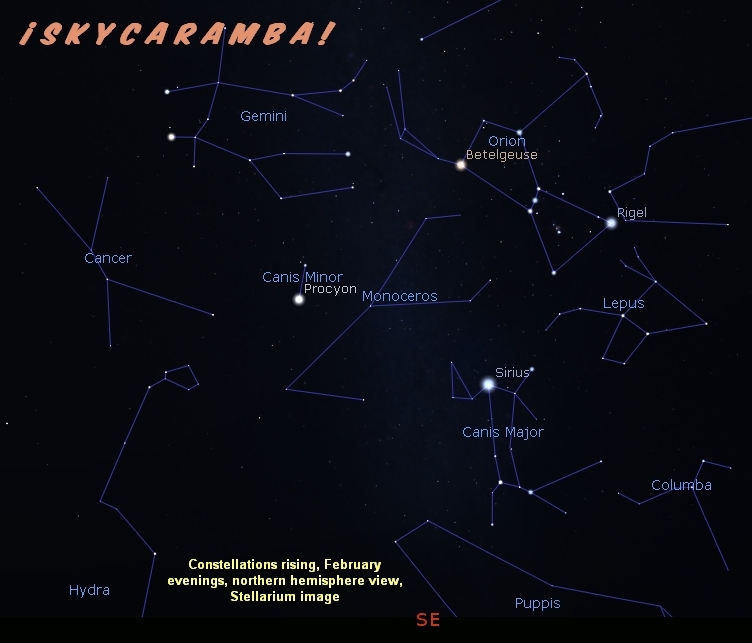 Orion and Gemini are high in the east when the evening’s darkness sets in this month. Lepus the hare is at Orion’s feet. Canis Major is rising. This is a good month to watch Hydra the water snake rise. 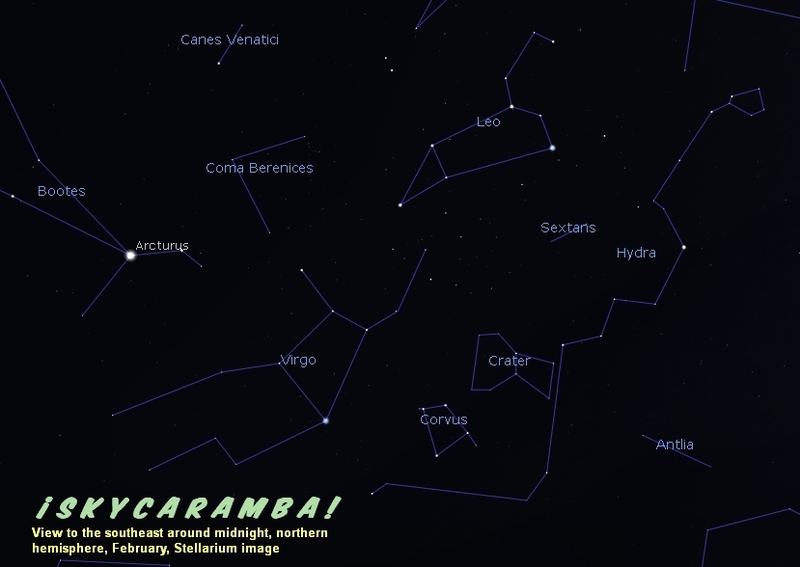 The longest constellation, Hydra’s head is above the horizon at sunset in February. But the end of its tail won’t rise until around midnight. Morning planet watching is exciting with a lineup of Jupiter, Venus, the moon, and Saturn on the 1st. Antares, the orange star of Scorpius, seems right at home in the lineup. The moon is quickly out of the picture. 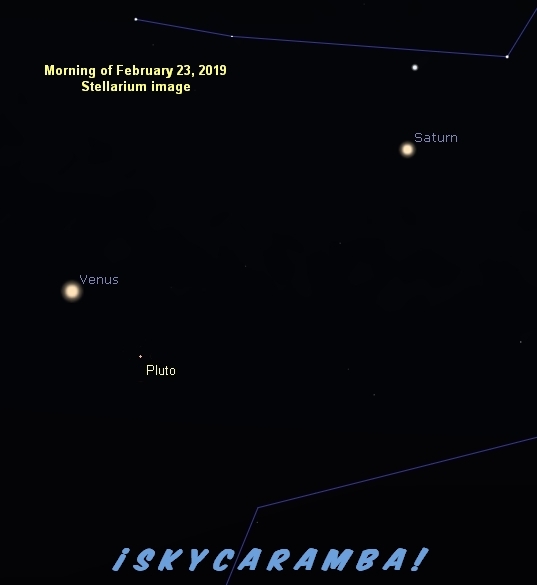 Venus moves quickly too, but there are many mornings in a row of the lineup as Venus moves atop the Sagittarius teapot toward Saturn. Saturn and Venus are closest around the 18th. The moon returns on the 28th. By this time, Venus is farthest left in the lineup. Venus continues sunward through Capricornus in March. Few astronomers are equipped to see it, but many will be interested to know that Pluto is out there in the lineup. Venus is 1.4° from it on the 23rd. Lunar apogee on the 5th is at 406,600 km. It’s the farthest apogee since December 2017. This month’s lunar perigee on the 19th is the closest since January last year at 356,800 km. With a full moon happening on the same date, popular media are likely to dub it a “supermoon”. Mercury is at perihelion on the 25th. Some astronomers take great interest in asteroid occultations. Since asteroids reflect so little sunlight and their gravitational tugs on other objects are so weak, it’s hard to tell how big and what size most asteroids are. One way of learning about them is to watch them block starlight. An asteroid named 1998FF70 will pass in front of a 5th magnitude star numbered HIP 41822 on February 7. Observers along a track in northern Asia, the northern Pacific Ocean, and Baja may be able to collect data about exactly when the star disappears and reappears. From that information, experts can figure out 1998FF70’s size and shape. 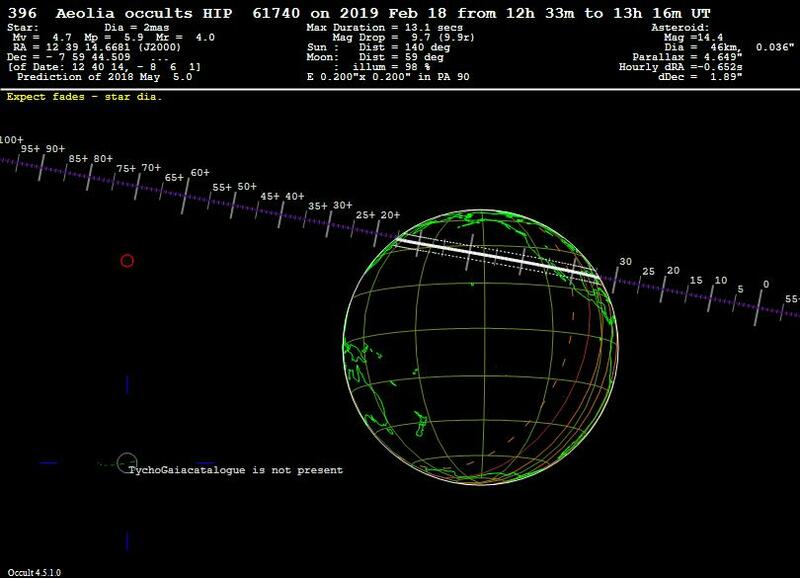 Likewise for asteroid Aeolia when it passes in front of 4th magnitude HIP 61740 on the 18th for observers in the north Pacific, northern Mexico, and the southern United States. If you have an interest in helping the scientists, contact the International Occult Timing Association to find out how. Moon phase dates in February 2019: new on the 4th, first quarter on the 12th, full on the 19th, last quarter on the 26th. 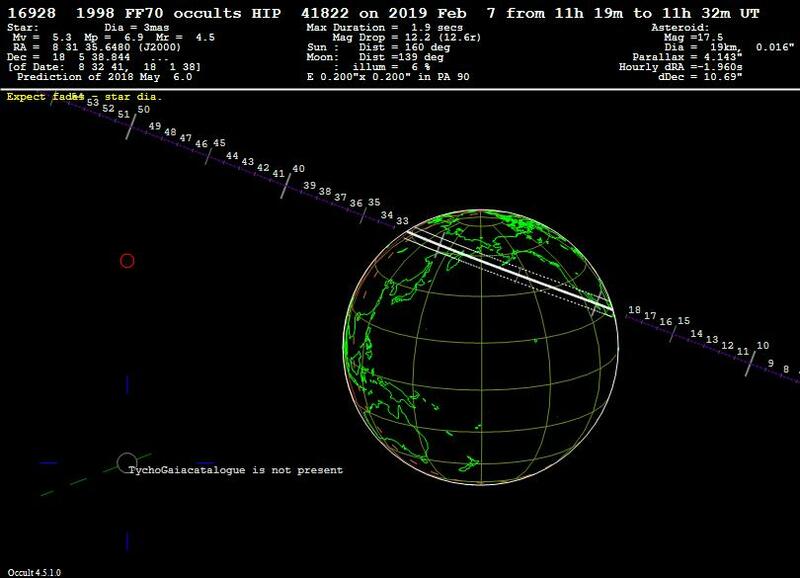 The moon’s orbital situation dates in February 2019: southern lunistice on the 2nd, apogee on the 5th, goes north of the equator on the 9th, northern lunistice on the 16th, perigee on the 19th, goes south of the equator on the 22nd. The moon passes 0.6° from Saturn on the 2nd, 0.2° from Mercury on the 5th, 3.0° from Neptune on the 7th, 5.7° from Mars on the 10th, 4.7° from Uranus on the 10th, 1.7° from Aldebaran on the 14th, 6.9° from Pollux on the 17th, 2.4° from Regulus on the 19th, 7.2° from Spica on the 23rd, and 2.3° from Jupiter on the 27th. 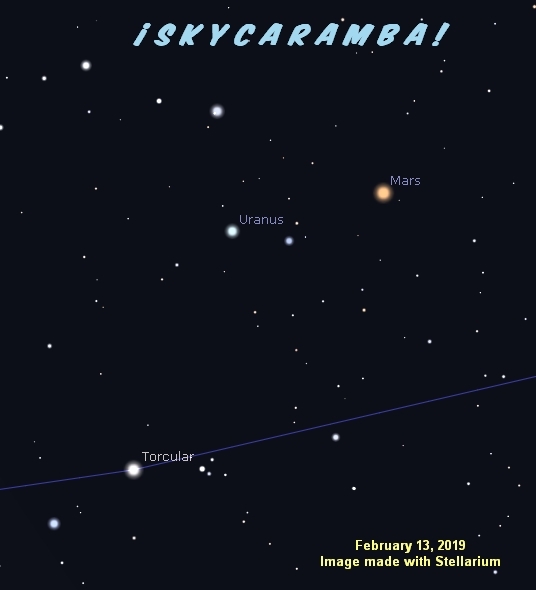 Uranus and Mars are 1.0° apart on the 13th. Saturn and Venus are 1.1° apart on the 18th. Mercury and Neptune are 0.7° apart on the 19th. Venus and Pluto are 1.4° apart on the 23rd.